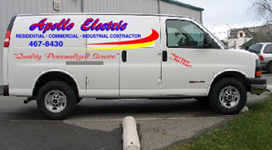 Apollo Electric, Inc. serves Spokane, Spokane Valley & Deer Park, WA. We are a residential, commercial and industrial electrical contractor located in Spokane, Washington. Apollo Electric offers professional electrical design, service, products and installation performed by highly trained electricians. Established in 1972, Apollo Electric has been family owned and operated since its inception. We strive to provide our customers with the best possible service and products available. Our electricians stay current with today's technological advances, and can design, repair or install electrical equipment that work with your home or business. If you're looking for an electrical contractor that can back up their claims of experience, look no further than Apollo Electric of Spokane, WA. Need an Electrician Today? 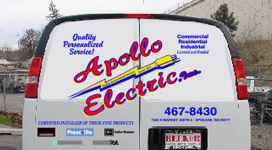 Look no further, call Apollo Electric to get quality personalized service.